Here in the Granite City area, along with much of Illinois and Missouri, there is a strong hockey culture and a large fan following for the St. Louis Blues. 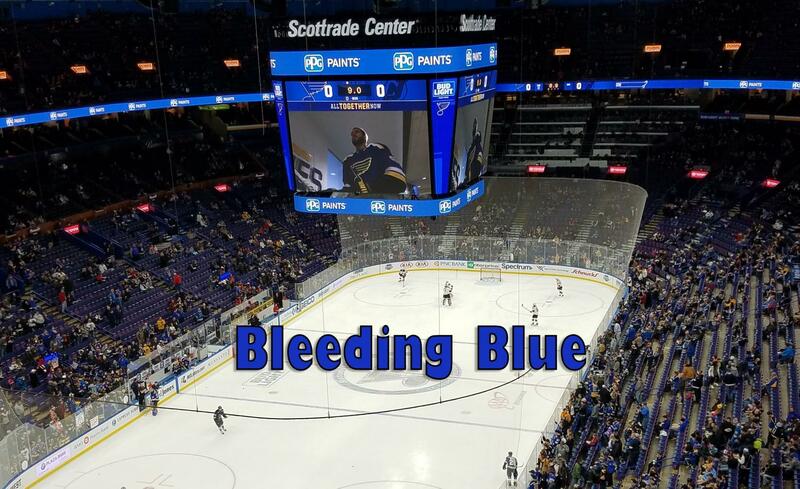 The Blues have always had a passionate fanbase, but now it seems that the support continues to grow as hockey rapidly gains mainstream popularity. There is an even mix of fans—some are new and some are more familiar with the current roster, and there are also those who have memories of the early days of the Blues. Some may remember them going to the Stanley Cup championship series for three straight years, those being the first three years of the team’s existence, or when the Blues had iconic players like Al MacInnis, Brett Hull, and Bernie Federko. Also, if you look at the attendance records for the NHL, the Blues are often one of the highest-ranked teams in terms of attendance, being ranked seventh overall last year for their 50th anniversary season. The St. Louis area keeps doing a remarkable job in supporting the Blues. I thought about my first theme game, which was “Pride Night” this year. I took one of my best friends to go with me because she had never gone to a game before. When I was given the tickets I actually didn’t know they were for “Pride Night”, but when I found out I figured it would be a good chance to see how fans act, and how the team contributes to a theme. It was a great night, and going to a game with one of your best friends is a joy in itself. If you’ve never been to a Blues game, trust me, you are missing out. “Some of my favorite players are Jake Allen and Vladimir Tarasenko. I also enjoyed watching T.J. Oshie and Barret Jackman when they played for St. Louis,” Cody said. He’s right. Tarasenko is incredible. He is the main offensive weapon for the Blues, and he’s just one of the many great players we’ve had over the years. I also love going through stats and watching games throughout the Blues’ history. History is always cemented in time, and the way teams form their own history amazes me. I know I have a lot of special memories of the Blues. I remember my first game, which was quite a few years back, where the Blues beat the Colorado Avalanche and I got a picture with Louie, the mascot, and had box seats for the first time as a fan at a sporting event. I also remember going to a game on my sixteenth birthday, where the Blues faced off against the Pittsburgh Penguins, and won in a high scoring shootout. I can’t forget to mention all the cheers and chants that fans partake in at every home game and taking part in them makes the experience so much more fun. The way the fans always come alive inside Scottrade Center has always made me excited. It’s something I look forward to every single time I watch the Blues play. The Blues may not have any Stanley Cups, and while there are always going to be bumps in the road for any sports team, there is an exciting team here in St. Louis and there is a fanbase always coming back for more. The fans form more than a simple group; there is a family in this fanbase, and in this family, we all bleed blue!